標語 : "Building an Inclusive Community"
^ a b c Levy, David Y. The University of Oklahoma: A History. Vol.I. Norman, Oklahoma: University of Oklahoma Press. 2005年. ISBN 9780806137032. ^ Classen Blvd and E Lindsey St, Norman, OK. Yahoo!Map. ^ O'Dell, Larry, Norman. Encyclopedia of Oklahoma History. ^ Historical Weather for Norman, Oklahoma, United States of America. Weatherbase.com. ^ City Government. City of Norman. ^ Employee Resources. Human Resources, University of Oklahoma. ^ Oklahoma's Weather Industry. Oklahoma Department of Commerce. ^ National Weather Museum in the Works in Oklahoma. USA Today. 2009年1月2日. ^ Home. Oklahoma Geological Survey. ^ A New Silicon Valley on the Oklahoma Prairie?. Huffington Post. 2008年10月6日. ^ SWeNT Opens Commercial-Scale Nanotube Manufacturing Plant. Nanotechnology Now. 2008年9月29日. ^ Company Background and Customers. Bergey Windpower. ^ Route 24. METRO Transit, Central Oklahoma Transportation and Parking Authority. ^ Best Colleges 2010: National Universities. p.5. U.S. News & World Report. 2009年. ^ Academic Interests. University of Oklahoma. ^ Home. Norman Public Schools. ^ Collections. Fred Jones Jr. Museum of Art, University of Oklahoma. ^ Weitzenhoffer Collection. Fred Jones Jr. Museum of Art. ^ Fleischaker Collection, Thams Collection. Fred Jones Jr. Museum of Art. ^ Vertebrate Paleontology. Sam Noble Oklahoma Museum of Natural History, University of Oklahoma. ^ Catlett Music Center. University of Oklahoma. ^ Oklahoma Football Quick Facts Archived 2007年8月20日, at the Wayback Machine.. University of Oklahoma. 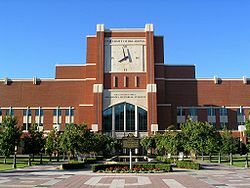 ^ Oklahoma Memorial Stadium Archived 2007年8月9日, at the Wayback Machine.. University of Oklahoma. ^ History of Medieval Fair. The Medieval Fair of Norman. ^ Home. Norman Music Festival. ^ About Groovefest. University of Oklahoma chapter, Amnesty International. ^ Knapp, Adam. Norman's May Fair Arts Festival. About.com. ^ Midsummer Nights' Fair. Firehouse Art Center. ^ Home. Jazz in June, Inc.
^ Summer Breeze Concert Series. The Performing Arts Studio. ^ 15th annual Norman Mardi Gras Parade Saturday. The Norman Transcript. 2009年2月20日. ^ Deering Selected as Holiday Parade Marshal[リンク切れ]. The Norman Transcript. 2009年12月6日.